Designing your perfect kitchen sometimes takes just a flash of inspiration; an object, a piece of furniture or a colour can give you the ideas and before you know it, the room has taken shape. If you have a wonderful log burner in your kitchen, you could design a beautiful cosy family kitchen around just one piece of equipment. Take the log burner and arrange everything else around it -you’ll be in good company as celebrities love to boast about how great their wood burning stoves look. Lily Allen and celebrity chef Hugh Fearnley-Whittingstall love theirs. Check out magazines for ways to accessorise and match your fashionable centre piece in style, and make sure you factor in enough ventilation when you plan your room – a wood burner needs to be well ventilated to work properly. Another big fashion statement for the ‘now’ kitchen is the refrigerator. No longer is a fridge just a dull white appliance humming away in the corner of the kitchen – with fabulous and quite frankly enormous fridges and freezers taking pride of place in many a kitchen, your kitchen can be accessorised to perfection. With a kitsch 1950s style American fridge freezer you can create a kitchen-diner to rival anything out of the movies. Retro kettles, toasters and enormous mixers are so fashionable at the moment that you could give your kitchen an amazing fifties’ makeover with very little effort at all. 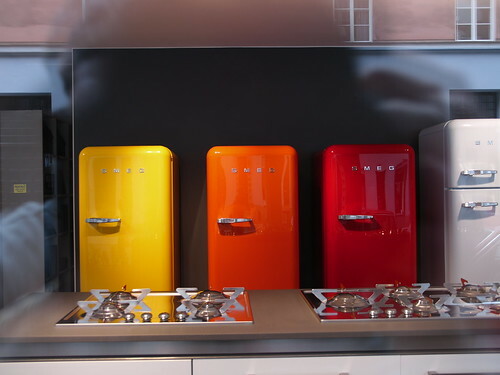 A fashionable fridge freezer can really set the tone for the rest of the kitchen, and with fridge freezers in so many colours and Smeg fridge freezers patterned with union jacks, denim, florals and more, you can really go to town and make your kitchen as funky, homely or unusual as you dare. You can match your tiles to the colour of the fridge (good luck if you opt for lime green) or just mix and match with your accessories to create a colour-coordinated kitchen haven. If you have an island or a breakfast bar, you can turn any average kitchen into a stylish living area. Give the island a cottage feel by adding a butcher’s block chunky style top, and provide an attractive focal point for the day’s activities. Or why not make a big feature of a breakfast bar instead? If your kitchen is narrow, a breakfast bar is usually more practical. You could design it like a coffee shop counter, with a coffee machine, mugs and a toaster all on hand. Matching materials and finishes can create a really stylish effect, as well as giving the kitchen an illusion of extra space. If you’re aiming for a larger look, keep your worktops and islands uncluttered – clever use of storage and a few well-chosen co-ordinating accessories can make all the difference. Slate worktops give a cool and understated elegance to any kitchen area, and you can easily dress them up, perhaps going for a modern, streamlined effect broken up with some quirky accessories to give the room a bit of warmth. 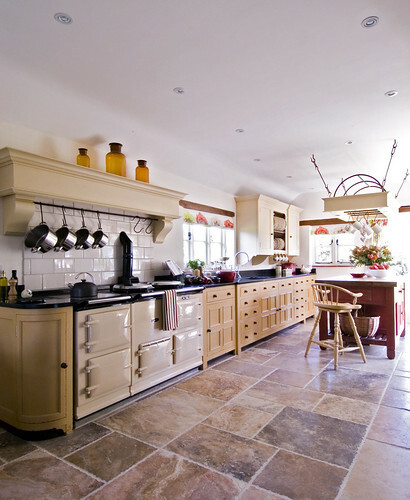 Keeping your kitchen warm is a must if you want to encourage people to spend time in it – open plan areas can sometimes feel a little chilly, so make the most of any wood burners and keep the heat circulating with well-planned spaces, cooker hoods and extractor fans to extract any unwanted cooking smells and keep the condensation out. Keep on top of all kitchen equipment repairs and make sure you choose well-insulated doors and windows that keep the room cool when you’re baking, but warm and cosy when you want a little family time. Written by Sam Wright, who has recently decorated the kitchen in her Victorian townhouse in London.